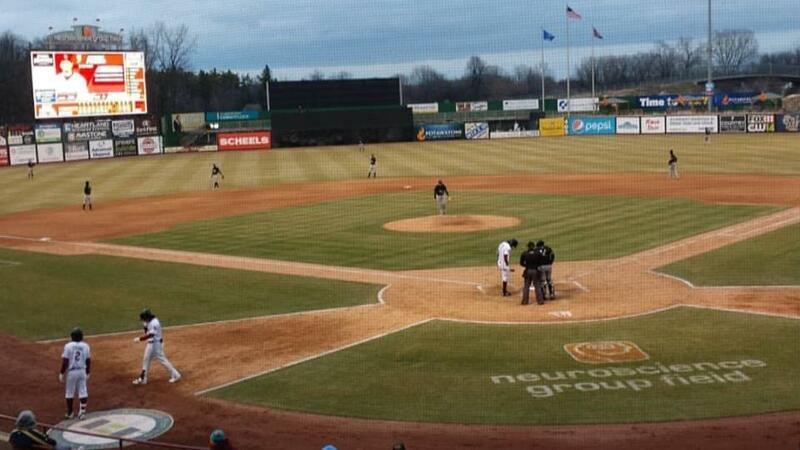 GRAND CHUTE, WI - The Wisconsin Timber Rattlers couldn't get started on a chilly Saturday evening in a 6-1 loss to the Quad Cities River Bandits at Neuroscience Group Field at Fox Cities Stadium. Wisconsin hitters managed just three hits while the defense committed three errors as the team dropped its fourth straight game. The River Bandits (6-3) went in front with a two-out rally in the bottom of the first inning. Wisconsin starting pitcher Reese Olson retired the first two batters of the inning, but walked Jeremy Pena to keep the inning alive. Pena stole second to move into scoring position. He scored on an error and Quad Cities was up 1-0. Quad Cities added to their lead in the top of the third inning with three runs on four straight hits to open the frame. Austin Dennis started the inning with a triple. Trey Dawson followed with an RBI single. Enmanuel Valdez was next and he doubled to put runners at second and third. Jeremy Pena closed out the rally with a two-run single for the 4-0 lead. Gabriel García got the Timber Rattlers (4-5) on the scoreboard with a two-out, solo home run in the bottom of the fifth. That was about the only offensive highlight for the Rattlers, who have seven hits in the last two games. The Bandits padded their lead back to four runs with a tally in the top of the fifth. Valdez started the inning with a double against reliever Max Lazar. He scored from third base on a wild pitch later in the inning. Another two-out rally in the seventh allowed Quad Cities to go up 6-1. Scott Schreiber singled with two away and moved to second on an errant pickoff play. Jonathan Lacroix cashed in the run with a bloop double to left. Wisconsin's bats went cold after the home run by García. They had no hits over the final 5-1/3 innings and only managed one more baserunner, a two-out walk to Antonio Piñero in the eighth. The Quad Cities pitching duo of Brett Conine and Matt Rupenthal combined to strike out a dozen Rattlers in the game. Conine struck out six over six innings. Rupenthal struck out six over the final three innings. River Bandits pitchers have 123 strikeouts in nine games this season and have 23 strikeouts in two games against Wisconsin. The final game of the series is set for Sunday afternoon at Neuroscience Group Field at Fox Cities Stadium. Justin Bullock (0-0, 12.27) is the scheduled starting pitcher for the Timber Rattlers. Mark Moclair (0-0, 5.40) is set to start for the River Bandits. Game time is 1:05pm. The left field berm has been set aside as a seating area for fans and their dogs on Sunday for the first of five Bark in the Park games presented by Fox Valley Animal Referral Center. Please see this release for details on the event and the guidelines to allow your dog to attend the game. The Rattlers, Fox Valley Animal Referral Center, and the non-profit Bark N Blue Foundation will be raising funds to cover the vet bills and recovery costs for Pyro, the Green Bay K-9 Officer who was stabbed during an arrest early last week. Donations may be made at the left field pet entrance gate on Sunday. Additionally, fans may play catch on-field courtesy of Rasmussen College starting at noon. Timber Rattlers players and coaches will wear their 2019 Brewers-themed jerseys for this game. The players will be available for a postgame autograph session sponsored by Tundraland. If you can't make it out to the ballpark, there are several ways to catch the action. The broadcast is on AM1280, WNAM and the TuneIn Radio app starting with the Papa John's Pizza Pregame Show at 12:45pm. The game is also available to subscribers of MiLB.tv.